This attractive Lifetime 6415 shed is a backyard attraction that has as much style as your house! You’ll appreciate the windows, skylights, and spacious headroom of this design. Lifetime’s 6415 shed comes with plenty of room for the big stuff and a shelving system and peg strips for the small stuff so you can find what you need, when you need it. Lifetime 6415 sheds are designed for style and durability. Constructed from high-density polyethylene (HDPE) plastic with sturdy steel reinforcements, our sheds are weather resistant to rusting, fading and cracking and never need painting! For routine cleaning, simply spray down with a hose. Note: This shed must be built on a flat level foundation of wood or concrete (not included). Made in the USA. 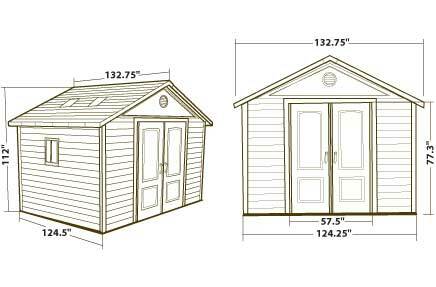 Consult local building codes before assembly.This shed must be built on a flat level foundation of wood or concrete (not included). Flooring must be anchored to the foundation. Anchoring hardware depends on the type of foundation you have and is therefore not included in the shed kit. Not including the installation of the foundation, you can expect assembly of the shed itself to take 2 adults up to 8 hours.